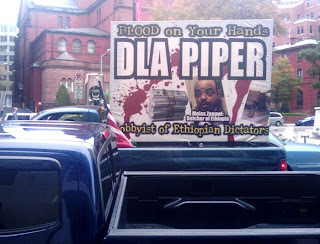 Bush Administration Ethiopian Policy Background: "Bush's Somalia Strategy Enables an Ethiopian Despot"
WASHINGTON - A pickup truck driving around Washington today displayed a large billboard in its bed accusing DLA Piper of lobbying for an Ethiopian dictator. Apparently, there are still hard feelings - though we're not sure who has them. Also see: "The CIA & the Brothers Krongard"
A.B. "Buzzy" Krongard is an outside U.S. director to our Global Board of Directors which has been organized to oversee and coordinate the worldwide operations of the firm. Mr. Krongard is the former Executive Director of the Central Intelligence Agency. The Executive Director is the third ranking position within the CIA and functions essentially as the Chief Operating Officer of the Agency. Mr. Krongard was the former Chairman and Chief Executive Officer of investment banking firm Alex. Brown, Incorporated. He currently is the Non-Executive Chairman of the Board of Directors of PHH Corporation, a leading outsource provider of mortgage and vehicle fleet management services. Mr. Krongard received an A.B. degree with honors from Princeton University and a Juris Doctor degree with honors from the University of Maryland School of Law. He served three years of active duty as an infantry officer with the United States Marine Corps. The State Department’s top oversight official has recused himself from all matters relating the private military firm Blackwater after admitting his brother served on the company’s advisory board. Inspector General Howard Krongard announced the move Wednesday just hours after initially denying that his brother, Alvin ‘Buzzy’ Krongard, is a Blackwater board member. The State Department has already come under criticism for its lax oversight of Blackwater since the September 16th killing of seventeen Iraqi civilians by Blackwater guards. Howard Krongard has previously been accused of thwarting probes of contracting fraud in Iraq and Afghanistan to avoid embarrassing the White House. Krongard is said to have refused to send investigators to Iraq and Afghanistan to probe three billion dollars in contracts.